2017 Rittenhouse Star Trek Beyond documents the latest crew of the U.S.S. Enterprise, as well as events from the other modern theatrical reboots. Every hobby box contains two autographs and one relic or pin card. 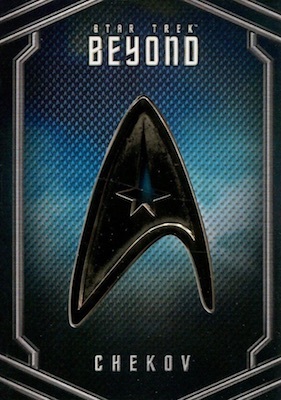 Although Star Trek Beyond is the primary focus, the set also covers Star Trek (2009) and Star Trek Into Darkness (2013). 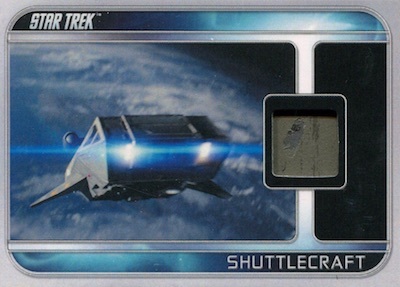 Of course, there are numerous Rittenhouse card releases for the franchise, including Star Trek Movies from 2014. 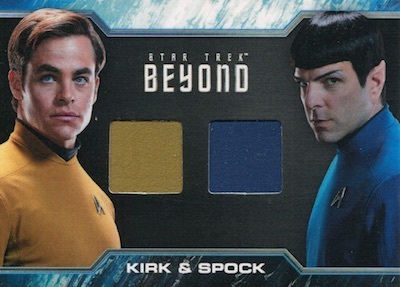 Diving into the 2016 film, Trekkies get a look back at memorable moments from Star Trek Beyond with the 72-card base set. Falling one per box are the Metal (#'d) base parallels. 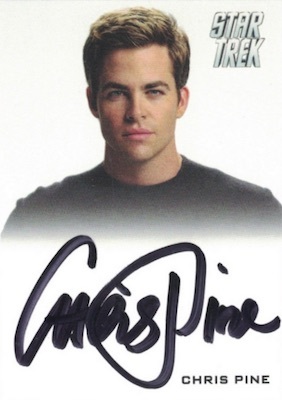 Collectors also have several inserts to chase, including the Metal Character Poster and Quotable Star Trek cards. 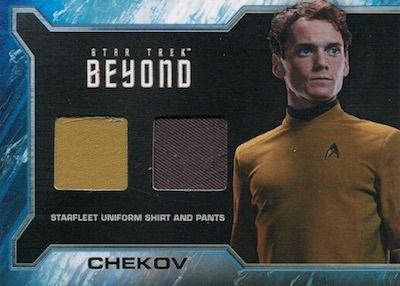 Additionally, Rittenhouse Star Trek Beyond pays tribute to the fallen members with Anton Yelchin / Chekov In Memoriam and Leonard Nimoy / Spock In Memoriam Expansion sets. Hand-drawn Sketch cards are another premium option fans hope to uncover. Tying in the three films, the Autograph lineup includes Bruce Greenwood as Captain Pike from Star Trek, and Alice Eve as Carol Marcus from Star Trek Into Darkness. Naturally, Star Trek Beyond is well represented with stars such as Chris Pine and Zoe Saldana. 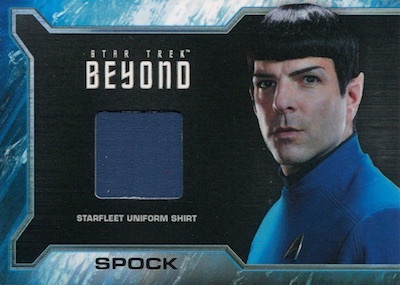 Boasting pieces of screen-worn items from Kirk and Spock, Rittenhouse Star Trek Beyond includes a host of memorabilia cards via Single Relics, Dual Relics, and Dual Character Relics. 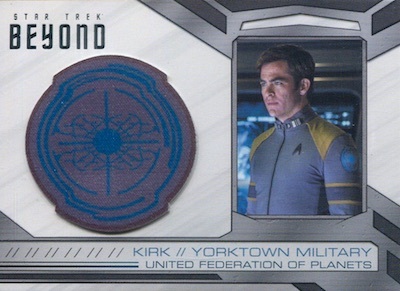 Furthermore, Uniform Patch and Uniform Pin, Prop Relic and Autograph Relic cards can also be found. 2017 Rittenhouse Star Trek Beyond Movie boxes carry suggested retail pricing of $99.99. PARALLEL CARDS: Metal #’d (1:24 packs), Printing Plates (Archive Box). Print Runs: Very Limited (VL) = 200-300 copies. Print Runs: Extremely Limited (EL) = 100-200 copies, Limited (L) = 300-500 copies. Print Runs: Scarce (S) = 100 or less copies, Extremely Limited (EL) = 100-200 copies, Very Limited (VL) = 200-300 copies. Print Runs: Extremely Limited (EL) = 100-200 copies, Very Limited (VL) = 200-300 copies. Individual card names were not provided. 3 cards. Not found in packs. 2017 Star Trek Beyond Movie Trading Cards Factory Sealed 12 Box CASE - 24 Autos!